Mayor de Blasio today appointed Cynthia López as commissioner of the Mayor’s Office of Media and Entertainment. A native New Yorker, López brings more than two decades of experience in New York City’s film and television industries and a commitment to nurturing talented, up-and-coming filmmakers and forging partnerships with top national media companies. As commissioner, López will build upon the city’s legacy as a film and television hub, with a focus on investing in new projects to diversify and build a more inclusive entertainment industry, and expand educational and training opportunities for the film and television industries. Mayor Michael R. Bloomberg, Carnegie Mellon Provost Dr. Mark Kamlet and Steiner Studios Chairman Douglas C. Steiner today announced Carnegie Mellon University will open the fourth new applied sciences program in New York City as a part of the Applied Sciences NYC Competition. An agreement between the City, Carnegie Mellon University and Steiner Studios will create Carnegie Mellon University’s Integrative Media Program, to be located at Steiner Studios at the Brooklyn Navy Yard. The announcement is the latest achievement in the City’s innovative Applied Sciences NYC initiative, which was created to expand the City’s top-tier applied sciences and engineering campuses to help spur economic growth and increase the city’s global competitiveness. The initiative offered to provide City-owned land, seed investments of City capital and the full support of the Administration to universities interested in establishing or expanding applied sciences and engineering programs in New York City. Carnegie Mellon University’s Integrative Media Program will be the first Applied Sciences program to provide training in creative industries that integrate technology and the arts. Governor Andrew M. Cuomo today announced that Steiner Studios, the largest film studios on the east coast, is moving forward with Phase III of its transformational Media Campus project at the Brooklyn Navy Yard. The announcement was made during a tour of economic development projects supported by the New York City Regional Economic Development Council, held at Steiner Studios. Brooklyn College and the Mayor’s Office of Media & Entertainment will today announce that the City of New York will make a substantial investment in the Brooklyn College Graduate School of Cinema, which is expected to welcome its first class of students in the fall of 2014. The school will be located at Steiner Studios – the largest soundstage and production facility on the East Coast, making Brooklyn College the only graduate school of cinema in the country to be integrated into a working film lot. The City of New York through the Mayor’s Office of Media & Entertainment will support the creation of the school and will be involved in various aspects of its development. The announcement will take place at the Brooklyn Chamber of Commerce’s Winter Gala as it recognizes leaders in New York City’s television and film industry. 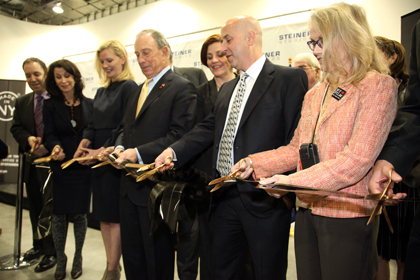 Mayor Michael R. Bloomberg and Media & Entertainment Commissioner Katherine Oliver today joined Steiner Studios Chairman Douglas C. Steiner to open five new soundstages at Steiner Studios in the Brooklyn Navy Yard. The new stages, totaling 45,000 square feet, will provide new and expanded opportunities for New Yorkers who work in the film, television and commercial production industry. The Mayor also launched initiatives designed to support and grow the industry, including new grants for training programs that prepare New Yorkers for careers in production and digital fields; a new entertainment component to the City’s mini-MBA partnership with NYU’s Stern School of Business; and a request for proposals for a “Made in NY” Media Center, which would provide media companies with affordable work space and other services.